The second-seeded Carleton University Ravens defeated the fourth-seeded University of Calgary Dinos, 101-79, to claim their sixth-straight national title on Sunday evening at Doug Mitchell Thunderbird Sports Centre. The matchup capped off an exciting CIS Final 8 men’s basketball tournament, where host team UBC claimed the fifth-place consolation prize on Saturday. The energy was lacking at tip-off. But by the end of the first quarter, the crowd’s volume had picked up. Attendance of 4,450 added to the tournament total of 24,754 spectators. Calgary’s Thomas Cooper, Canada West Conference MVP, was blocked twice in the opening two minutes of action, displaying Carleton’s strong half-court defence. Cooper was blocked once again mid-quarter while his teammates struggled to hit shots. The Dinos’ isolation offence provided options for Thomas Cooper — a standout all season for them — but stood in stark contrast to the Ravens’ pass-heavy, swing-and-shoot style of play. Carleton hit another three with just under five minutes left in the opening frame to extend their lead to 16-6. With some aggressive drives to the hoop, Calgary started to gain some momentum late in the quarter. 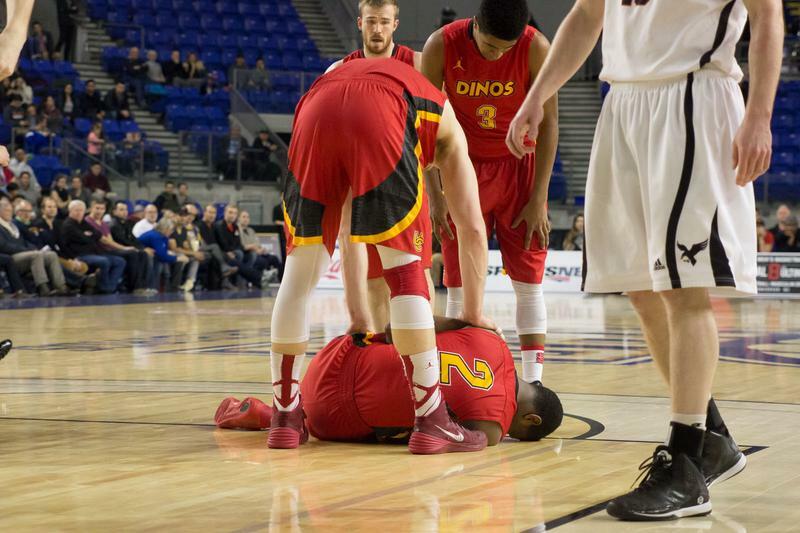 However, continued strong shooting from Carleton prevented the Dinos from climbing back. Entering the second quarter, Dinos’ fifth-year veterans Josh Owen-Thomas and Matt Letkeman provided leadership with Owen-Thomas hitting back-to-back jumpers, while Letkeman picked up a nifty layup in the post. Midway through the second, Carleton had solidified a comfortable 16-point lead to the Dinos. Calgary’s three-point shooting from Cooper, Owen-Thomas and Jasdeep Gill was one of the redeeming factors in their offence. Calgary struggled to hold on, especially after Carleton’s Gavin Resch hit an impressive fading three-pointer to beat the shot clock at the four minute mark. Resch nailed another long shot a minute later, finishing the half with 12 points. With under two minutes in the half, Calgary’s Cooper injected energy into his team after driving to the rim and finishing a nice up-and-under move. However, the Dinos failed to hit any more big shots while the Ravens’ three-point dominance put them up 48-32 by halftime. The Ravens’ team-oriented play style gave them 14 bench points to Calgary’s six, while the Ravens shot better from behind the arc (43.5 per cent) than they did from the field overall (43.2 per cent). The third quarter saw Calgary control the pace in the opening minutes, but their shooting woes continued, especially after missing three consecutive layup put-backs in the same possession. Carleton’s help-side defence stopped Cooper’s continuous drives to the hoop, keeping him to only six points in the third quarter. After Kaza Kajami-Keane nailed a deep three-pointer for the Ravens, the Dinos struggled to gain momentum for several minutes mid-quarter. Letkeman could not hold onto the Ravens’ clean-shooting Ryan Ejim who nailed four straight jump shots, two off a dribble drive into the paint. The still determined Dinos remained tenacious, hitting a half-court buzzer-beater to end the third quarter. The score was at a daunting 71-56 entering the final period. Two minutes into the fourth quarter, Carleton’s Kajami-Keane picked up a pair of steals, notching four easy transition points for the Ravens. The Dinos’ increasingly panicked tempo led to a number of turnovers as the team struggled to convert transition attempts. Bucard had the play of the quarter, spinning and pivoting on the baseline and, being fouled, hit an off-balance layup. The Ravens continued to give the ball to Bucard in the high post and found three-point production from guards Gavin Resch and Connor Wood. In the final two minutes, Calgary resorted to a swing-and-shoot offence. But similar to the first half, they could not find their rhythm shooting from downtown. Connor Wood received the honour of Tournament MVP and Player of the Game for the Ravens. Thomas Cooper received Player of the Game for the Dinos. Cooper led the Dinos’ scoring with 25 points along with seven rebounds and four assists, while teammate Kapinga posted 15 points. Wood led the Ravens’ scoring with 22 points and Resch finished with 18 of his own. Kajami-Keane notched 15 points and 10 assists, while Boucard and Ejim tallied 12 apiece to round out the starters for Carleton.